These general purpose Platinum RTD probes contain Omega's DIN Platinum thin film RTD elements connected directly to a fiberglass insulated, fiberglass jacketed, stainless steel overbraided cable without the need for extension wires or metal transition fittings. This design makes for a more compact and reliable probe where space limitations are a factor. Note: This product is not available in 1/8" or 3mm probe diameters. If a 1/8" or 3mm diameter probe is required, the PRTF-11 with transition fitting or the PRTF10-E-BX with square locked metal hose are recommended. For this product with a fiberglass insulated and jacketed cable. For this product with a fiberglass insulated cable and square locked hose. Standard: To order probes in intermediate lengths (2" minimum), change length in model number and use next longer probe price. To order 2-wire sensors, change "-2" to "-1" in the model number at the same price. To order 4-wire sensors, change "-2" to "-3" in the model number and add $5 to the price. For probe lengths over 24", change length in model number and add $1 per inch of probe length. For cables longer than 40", add cable length to end of the model number and add $2.50 per foot. Metric: To order probes in intermediate lengths (50 mm minimum), change length in model number and use next longer probe price. 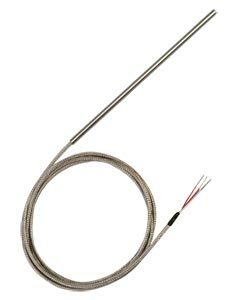 For probe lengths over 600 mm, change length in model number and add $1 per 25 mm of probe length. For cables longer than 1 m, add cable length to end of model number and add $7.50 per meter. To order with shrink tube strain relief, specify “-ST” at the end of the model number at no additional charge. For MTP or OTP connectors, add “-MTP” or “-OTP” to model number and $8.